Tiki vs. Tropical: What's the Difference? Tiki vs. Tropical: What’s the Difference? Tiki drinks. Tropical drinks. Both are commonly served—and consumed—by people wearing Hawaiian shirts, and have a tendency to come with tiny paper umbrellas on the side. But for all the similarities in culture and presentation, there’s clearly a dividing line between tiki and tropical. Searching for that line brought me into conversation with Vikram Hedge. He serves as the Bar Director for Ken Oringer and Jamie Bissonnette’s Boston restaurants and recently launched a new tiki menu at UNI, Oringer’s upscale izakaya. The first thing Hedge pointed out was the overlap between the two. Even tiki drinks that lack tropical flavors still have something in common with the other genre, thanks to the relationship of flavors. Hedge sees sweetness as the central flavor of a tropical drink, unfettered by the more complex ingredients that turn up in tiki. “Sweet is usually the main flavor, maybe a little bit of acidity but that’s it. With tiki, you’re looking at umami and you’re looking at spice. You’re trying to get more parts of the palate engaged,” Hedge says. Some drinks begin tropical in base, but reach tikidom by addition. “Tropical drinks don’t necessarily have to have anything beyond those fruits that you associate with the tropics. A Malibu and pineapple juice is a tropical drink. 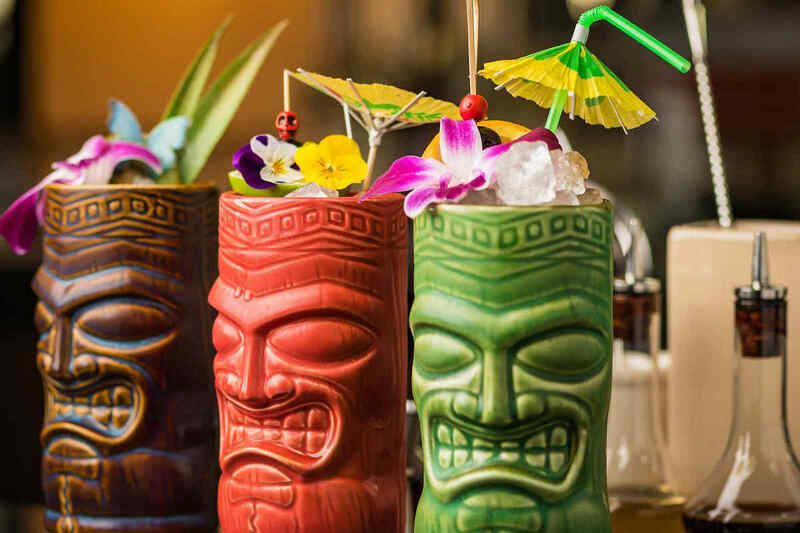 But as soon as you start layering extra flavors on top of it like allspice dram or falernum, you start edging into the tiki realm,” Hedge says. Vikram Hedge. Photo by Andrea Merrill. Tiki drinks tend to use a greater diversity of spirits, whether that’s a combination of different rums or even gin. Unsurprisingly, Hedge sees a lot of common ground between the two genres. As an example, he cites one drink’s ability to play both sides, provided that some additions are made. Another in-between libation cited by Hedge is the Blue Moon, made from gin, lemon juice, and crème de violette. While the Mai Tai pops up on many non-tiki menus, it’s often a result of the drink’s tropical-ization. “They’ll usually add some sort of passion fruit, or something like that, to make it more tropical. People just associate Mai Tais with tropical drinks, even though it’s originally more about the spice than any sort of fruit,” Hedge says. Will Tropical Have Its Renaissance? A large-format tiki drink at Uni in Boston. From bars to books, tiki has undergone a remarkable revival over the last decade. But the same can’t be said for tropical, which is still closely associated with Frozen Daiquiri machines and The Cheesecake Factory. Despite these hurdles, Hedge feels optimistic. But better bartending practices are only half of the equation. For tropical drinks to make a comeback, the average drinker’s perception will need to change, too. Hedge believes that there’s more depth hiding in those tropical flavors than many drinkers realize. The final requirement for a tropical resurgence is something that’s closely aligned with the spirit of tropical and tiki alike: checking your inhibitions and having fun.